﻿ Cabinet approves MoU between India and Indonesia on combating illicit trafficking in narcotic drugs, psychotropic substances and its precursors. Cabinet approves MoU between India and Indonesia on combating illicit trafficking in narcotic drugs, psychotropic substances and its precursorss. 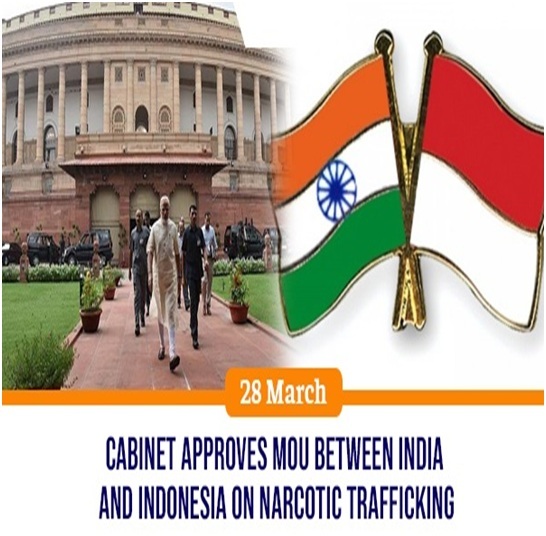 The Union Cabinet, chaired by the Prime Minister Shri Narendra Modi, has approved the signing of Memorandum of Understanding (MoU) between India and Indonesia on combating illicit trafficking in narcotic drugs, psychotropic substances and its precursors. The MoU will help in mutual cooperation in regulation of narcotic drugs and psychotropic substances and in combating drug trafficking. It will come into force on the date of signing and will remain in effect for a period of five years. India has signed similar Conventions/MoUs/Agreements with the 37 countries. •	The MoU shall facilitate and enhance the cooperation between the two countries in combating illicit trafficking of narcotic drugs, psychotropic substances and its precursors as defined by the United Nations International Drug Control Conventions. •	The cooperation under this MoU includes the exchange of information on existing legal instruments of national legislation of both countries in combating the illicit trafficking of narcotic drugs psychotropic substances and its precursors, allowing and assisting each other in the use of controlled delivery operation with a view to identifying persons involved in illicit trafficking in narcotic drugs, psychotropic substances and its precursors and essential chemicals, prevention of money laundering. •	Under the MoU, there is a provision of maintaining the secrecy of information and documents obtained in accordance with this MoU.